In general, granite countertops are durable work surfaces with just a few problems, if they are installed and cared for in the proper way. However, mainly due to variations in granite composition, the proper maintenance routine of a particular granite countertop varies based on its porosity. For instance, if the granite countertop is green or dark black, the natural stone may be dense enough not to require a granite sealer. In such particular cases, the applied granite sealer cannot penetrate the whole surface of the granite countertop and it can even cause an unwanted dulling that can affect the appearance of the granite surface. This is the main reason why you should determine the density of your granite countertop before you start restoring its surface. Also, you will have to establish whether your granite countertop has a honed surface because this means that it has an intentionally dull appearance. In order to restore your granite top, you will need a soft cloth, #0000 grade steel wool, mild detergent, spray bottle, sealer, buffer, polishing products, liquid wax and an automotive rubbing compound. Start by cleaning your granite countertop by using the mild detergent. Remove all the grit and stains otherwise, they will be sealed right into your granite countertop. Also, remove any existing wax  use the stone wax removal product/ #0000 grade steel wool in order to do this. Wipe everything with water and dry the entire surface by using the soft cloth. Next, you will have to let your granite countertop dry out completely  this may take up to 4 hours and the amount of time will depend on the porosity of your granite countertop. 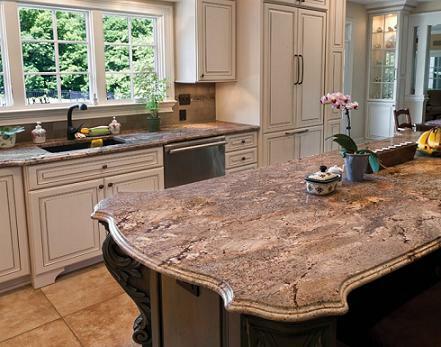 Remember that your granite countertop must be completely dry in order for you to start applying the necessary sealer. Make sure that you apply the sealer by paying attention to all the instructions provided by the manufacturer  use the spray bottle in order to apply this granite sealer evenly. Any sealer residue must be wiped off. Let the granite countertop dry thoroughly. Then, you will have to apply the automotive rubbing compound, then the Carnauba-based wax  buff everything by using a quality standard car buffer until you get the shine you want to have for your granite countertop. Also, you can use the silicone-based polish product in order to get a higher shine, but you should know that using such a granite polish will leave a slimy and greasy appearance on your countertop. Make sure that you clean and reseal the granite countertop twice a year and mop up any spill quickly in order to avoid further staining.